Today we are packing up and getting ready to set off on a camping tour of Northern British Columbia. Summer travel always poses a dilemma. We devote every spring and early summer to developing and nursing along our gardens. And then every August we go away for a holiday and let the gardens fry in the sun, and the vegetables and fruits go uneaten. You would think we would learn from past years' experience and alter this pattern, but no, we do it every year. 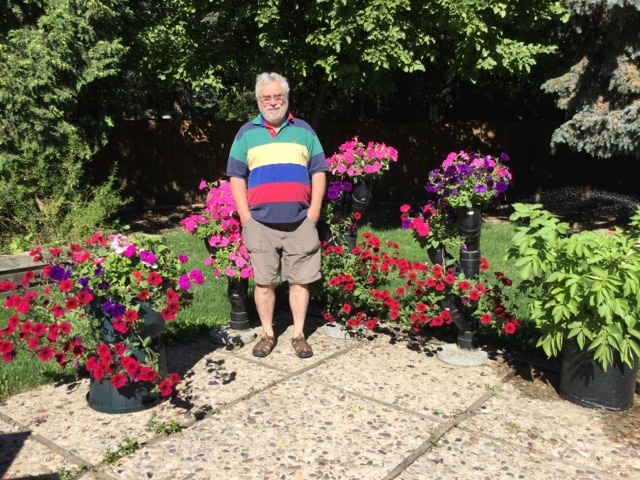 The photo above shows Rob this morning standing at the corner of our patio (click on the photo to see the full width of it). Behind Rob are three planters that he built with ABS pipe. He used 4 inch pipe with many elbows, and mounted them on concrete paving stones. We filled each opening with soil, and it works perfectly for wave petunias. They thrive in the planters, in fact doing much better than those that we have planted in the front annual bed. To the left in this photo is a regular patio tub planted with more wave petunias and a geranium. To the right is a potato bag. Yes, I am the vegetable gardener of the family. As I have only a tiny garden plot, I have taken to planting potatoes in bags. I set the bags along the edge of the patio next to the petunias, and I think they look quite lush and decorative! The potato bags are available for purchase at our local garden centre. They are made of a woven polyethylene material (according to Rob), and have grommet holes around the bottom so that excess water can drain out. They way I plant them is as follows. I put a few inches of black garden soil and compost in the bottom. Then I arrange three or four seed potatoes on the soil (I like to use Yukon Gold potatoes for the bags). Then I just cover the potatoes and their sprouts with more soil and water well. Once the potato plants come up and before they are not more than about three inches tall, I completely cover the plants with another layer of soil. Then I arrange three more seed potatoes on that layer and cover them. I repeat one more time, ending up with three layers of potatoes, and a bag that is filled to the top with soil. The first year that I tried potato bags, I was sceptical. I thought the layer of soil over the plants in the bottom layer would smother them. I thought there would not be room for nine or ten plants in one bag. But, amazingly, the potatoes thrive in the bags. 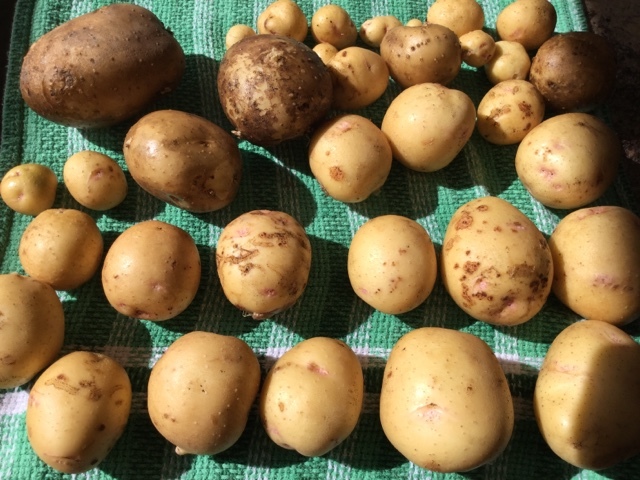 Here is a photo of the potatoes that we harvested from one bag yesterday. I have actually had more success with the potato bags than I used to have hilling them in the garden the traditional way. (Mind you, I lived in a completely different climate then - a coastal rainforest - and I had a garden infested with comfrey plant run wild, which is hard to get rid of when you garden organically). A few tips I have learned for growing potatoes in bags are: 1) water them very regularly and throroughly; 2) don't use manure enriched soil; 3) they grow better in a sunny spot rather than part-shade (the patio is the sunniest spot in our backyard); and 4) harvest them a week or two after they flower. There will be some tiny potatoes. However, I have found that if I wait a lot longer to harvest them, some of the potatoes on the bottom layer will have begun to to sprout extensively. So, added to the usual tasks of packing and getting ready to go, we are doing some frantic last minute gardening this week. The upside is that we will be setting off with freshly harvested potatoes and bags of fresh herbs and greens as we leave on our camping holiday. As a child, I didn't think much of raspberries. Growing up in northern British Columbia, Canada, raspberries seemed ubiquitous, and therefore of little account. My parents had a large garden with a sizeable patch of raspberry canes, as well currants, gooseberries, strawberries, rhubarb, and northern hardy fruit trees. From a young age, I was expected to help pick raspberries, a never-ending task. At that age, I think more raspberries found their way into my mouth than into the picking pail. 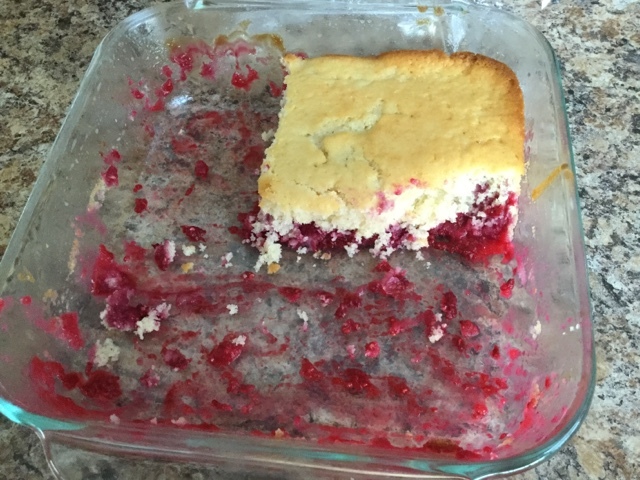 My mom made raspberry pies, which I was always happy to eat, as well as jelly and jam. In my later childhood, after a brief interlude of staying with my aunt in what had been my Grandma's downtown house while my parents sold the first house and bought another, we moved to a different house in the same town. At my aunt's house, there was a large raspberry patch. My Dad said that he had put that patch in for his mom when she had moved into town from the farm. Those raspberry canes came from the family farm where my grandparents had homesteaded when they first moved to the valley. So when we moved to our new house on the hill which had only flower gardens, my parents had to start over in developing a vegetable and fruit garden. Dad brought some raspberry canes up from my aunt's house. They thrived and multiplied. As all of us grew up and moved away and the raspberry patch expanded, the picking and processing of raspberries became a time consuming job for my Mom every summer. She made and froze pies to supply to church and community events throughout the upcoming year. Every summer she made dozens and dozens of jars of raspberry jam and raspberry jelly, as well as cherry, currant, gooseberry, and plum jam and jelly. She supplied all of her friends and the soup kitchen/food bank with jam. Every time we visited, we came away with a boxful of jars of her homemade jellies and jams. And still there was jam to spare. When I left home to go to university and then in the early years of my career, I moved a lot. For a period of fifteen years, I moved on average twice a year. The longest I stayed in one place was in my first house in Regina, where we lived for 21/2 years. During that period of my life, I lived in university residences, in apartments, with my boyfriend's parents, in a shared house, in rental houses, and in my own house. Few of those places had yards, and those that had yards did not have fruit or vegetable gardens. The only place that I lived in all of those years that had a raspberry patch was my boyfriend's parents' place. In every place with a yard, I would develop a little vegetable garden, only to move on again before the garden really started to thrive. During those years without a garden, I came to appreciate raspberries. I would look at the tiny cartons of raspberries in the grocery stores, and could never bring myself to buy them at the outrageous prices, knowing that they would taste insipid compared to fresh-picked ones that I was used to. Store-bought jams tasted so processed and overly sweet. When we visited my parents in northern BC, I spent time in the raspberry patch, happily eating raspberries and helping my Mom pick. When we bought our second house in southern BC, we put in a vegetable garden and a raspberry patch, and planted a plum tree and a cherry tree. We stayed there long enough - five years - to benefit from the vegetable garden and raspberries, but not the fruit trees. When we moved back to northern BC and bought our third house, I made a trip to my parent's town. My dad dug up some of my Grandma's raspberry canes and I brought them home and planted them. This third house had a big yard but no garden, so once again we developed a garden from scratch. We also planted two northern hardy apple trees and a northern cherry tree. We stayed here eleven years. Like my Mom, every summer I made jams and jellies from the raspberries, strawberries, apples, and cherries. And then I moved again, to another northern town. Once again, there was no garden. However, there was a decrepit greenhouse, and many fruit trees. I repaired the greenhouse, put in a vegetable garden, and established a raspberry patch, and strawberry patch. Mom divided a gooseberry and black current bush, and provided me with a small plum tree (originally from her Dad's orchard) which I planted in the yard. We enjoyed this house and garden for eight years, then moved to the prairies. We have a lovely house here that has been professionally landscaped. But, as I have written before, it had no fruit or vegetable gardens. Two summers ago, I put in raspberry canes and now they are truly thriving and bearing well. So far this summer, I have made a raspberry pie, a raspberry pudding cake, raspberry sauce for pancakes, and frozen some berries. Meanwhile, my Mom who is now in her eighties, has sold her house in northern BC and bought a lovely first floor condo in the downtown area of her community. The house and yard were getting to be too much to manage. However, she struck a deal with the fellow who bought the house (a young man who is not particularly interested in fruit trees and berry bushes) that she can come and pick fruit and berries whenever she wishes. I was talking with her on the phone this week, and she said she had been up to the house to pick raspberries, and has made a couple of batches of jelly and jam. My perspective on raspberries has changed. Now I appreciate them, and feel grateful to be able to grow my own, or to savour homemade raspberry jam. Like my Mom, I hate to waste a single berry. 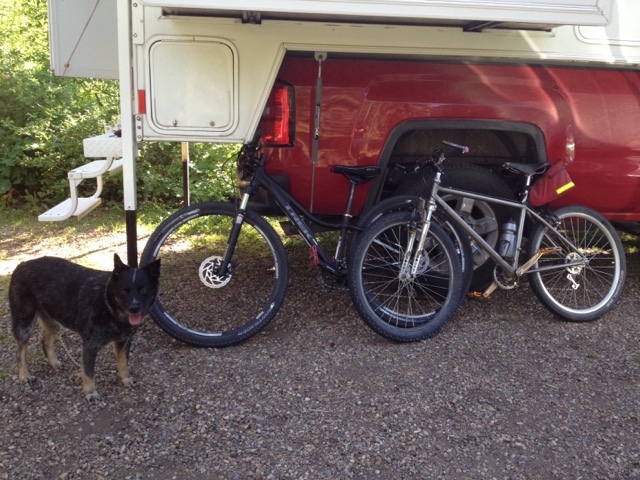 We decided to start off my leave period with a camping holiday in the Cypress Hills Interprovincial Park in the southern part of Alberta and Saskatchewan. Neither of us had been there before. We loaded up the truck and camper and headed out about a week ago. The Cypress Hills are an interesting anomaly. During the last period of glaciation when ice covered the central part of North America, the area that we now call the Cypress Hills was not covered by glaciers. Rather, the ice, and later the meltwaters, flowed around this area leaving a range of hills about 140 kilometres long standing above the prairies. This stretch of hills has the highest elevation between the Rocky Mountains and Labrador. There are varieties of plants and animals that differ from those on the surrounding prairies. It is a really beautiful area with many trails for hiking, biking, and cross-country skiing. We camped in the Elkwater Lake area. On Monday (a week ago) we went on a mountain bike trail ride. We ride our mountain bikes quite regularly, including on trails, although we generally choose easy to moderate routes - not the extreme or highly technical trails. We set off riding through mixed woods and meadows. We were on our way to the Horseshoe Lookout, and we made a short excursion toward Old Baldy to look out over the Lake. From Old Baldy, it was uphill all the way. However, aside from the strenuousness of riding uphill, the trail was wide and easy to ride. The photo above shows Rob pedalling up the hill. Near the top, there were beautiful fields of wildflowers. At the lookout, we had a terrific view of the prairies to the north and west. We rested and ate our picnic lunch. At this point, we had gone seven kilometres. We planned to ride a loop route, taking the Beaver Creek Trail down. Like the Horseshoe Lookout Trail, it was marked as intermediate. 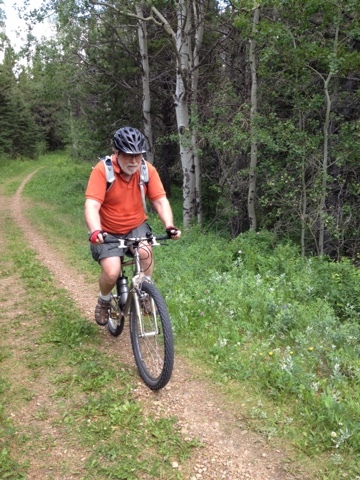 We rode along the top on the Plateau Trail for about a kilometre, then dropped down onto the Beaver Creek Trail. A little ways along, the trail narrowed to a single track. Then soon it became very narrow and twisty, with steep little drops and rises, and sharp corners. However, the really challenging part was the roots. There were many big tree roots and rocks on the trail, which made it difficult to ride. Although I have ridden on narrow trails before, this was the most challenging trail I have ridden. It was not at all like the route we had taken up. Oh yes, it was muddy as well, with several narrow bridges. And then suddenly, my front wheel hit a root or small stump. The bike stopped dead, and I flew over the handlebars. I landed on the ground with my bike on top of me. In reconstructing the crash, I think I landed on my right forearm and did a kind of a somersault. When Rob came along, I was sitting on the trail yelling "Ow, ow, ow!" along with some choice words. My right arm was in pain; it must have landed on a root. Rob took one look at it and said that I had broken my arm. It swelled up instantly and looked distended. He said that he had heard the sound of something snap. We fashioned a sling out of Rob's spare long-sleeved shirt. Then we started walking out, down the trail, with Rob pushing both bikes. We were probably close to halfway along this section of the trail when the accident happened. It was not a well-used trail. Eventually, two people came along, Olga and Steve from North Vancouver, and they helped us. They walked with me to the Park Information booth so a medic could look at my arm, and drove Rob up to the campsite to get the truck. They were really nice, and I was so grateful for their help. The medics put a splint on it, and then we drove to the Medicine Hat Hospital. The emergency room was very busy, and we spent hours there. They X-rayed my arm. While I waited, I contemplated glumly the prospect of starting my leave with a broken right arm. I finally saw the young curly-headed Doctor, who spent most of his brief consultation exclaiming how amazing it was that I am still mountain biking at my age. It turned out that there was no fracture, just soft tissue damage. Yay! So we went for Thai food, then headed back out to the campground. The rest of the trip, we hiked but didn't bike. I figure that the snapping sound Rob heard was the visor of my bike helmet coming off when I fell. I was using an app on my phone to track our bike trip. Altogether, we had biked and then walked a total of 15 km. 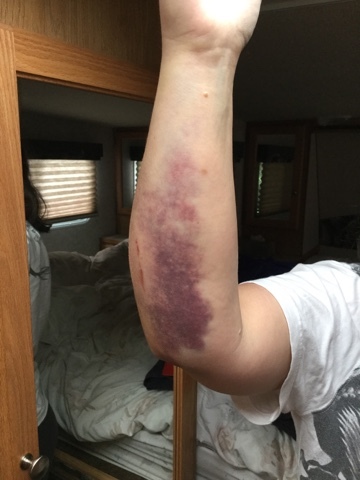 This photo shows the arm the morning after the crash. Now, a week later, the bruise is even bigger, stretching from above my elbow to the knuckles of my hand. It is still quite sore - but it isn't broken! I plan to keep on biking, although perhaps a little more cautiously. On Friday morning, Canada Day, I woke up with a sentence in my mind. The sentence was, "Today is the first day of the rest of my life." A cliche, yes, but also a propos to my current circumstances. As of July 1st, I have left my position as an administrator, and am beginning a ten month leave from work. I have written here before about my frustrations with work, and my struggle to find some sort of work-life balance. Although there have been many satisfactions in my work role and a tremendous opportunity for learning, my frustrations have primarily centred on the extremely long hours and high stress of the position. I have also struggled to become comfortable with and feel part of the culture of this organization (and this city and province). Many times I have wondered about my decision to take this position, which has seemed like a strange zig zag in terms of my career interests. I have also written about how exhausted I feel after my long hours of work, and how I have felt that I have had to defer so many other things - time with family, a social life, my writing, my art, travel, and outdoor pursuits like skiing and hiking - due to the all-consuming maw of work. I also realized how unhealthy my excessive working was when I broke a bone last year and it failed to heal. For the past year, I have begun to muse about retirement. So this last month has been a surprise to me, because, as it has turned out, I have found it to be quite difficult to let go of my work. For weeks, I have had my head down working, very focused on finishing up projects and developing a transition plan for my team. I gradually extricated myself from each project and committee, and did not take on any new projects. I met with various team members and committees and said my good-byes. The final week of June was moving week. My assistant had ordered boxes and booked movers to come mid-week to move me to another office in another building. However, I needed to pack and unpack the boxes myself. As I have moved offices several times before, I have a system, and I did it all in an orderly manner. 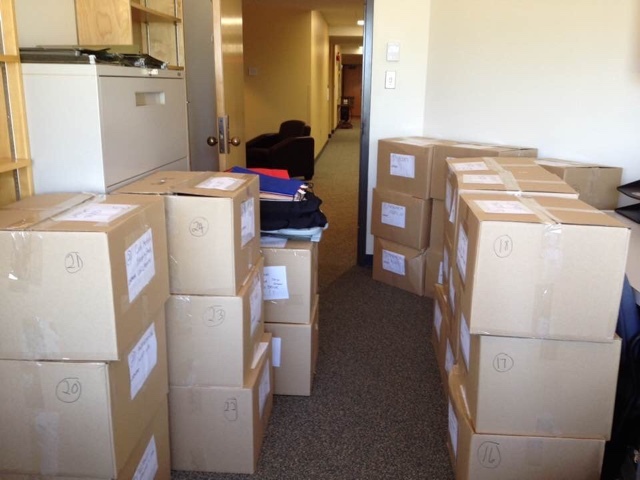 In the space of four days, I packed and then unpacked 27 boxes (2-cubes), mostly with books and papers. It involved a lot of climbing up to get books off of and then put them onto high bookshelves. By Thursday, I was physically tired and sore all over. During these days, I also spent time going through all the hard copy files that I left behind for the next person to fill my role, and throwing out a lot of no longer relevant material and my hand-written notes from meetings, etc. I also went through my electronic files, editing and organizing them and setting up a shared folder for the next person. As I have written here before, it is a strange and disconcerting feeling to realize that much of the history, knowledge, and information about the position and projects is in my head and goes away from the job with me. It seemingly "disappears." Besides the hard work of packing up and unpacking, I found it was an emotional time. I felt sad to be leaving my team and colleagues. When I come back from my leave, I will have a different role, and will not be working with many of my present colleagues. I felt sad to be leaving my career path. Now I am making another zig zag, and with change comes uncertainty. It also was hard to step away from the projects themselves. I was personally invested in them and had poured a lot of effort into them. So with the focus on finishing up and transitioning out, I had put little thought into what came next - my leave period. On my last day, Thursday, I came home feeling not glee, as I had expected, but grief for what I was leaving. I also was so very, very tired. A few days have passed. I have slept a lot. I have sat out on the patio, reading a little, but mostly just looking at the trees and the gardens. I have gardened a bit and cooked a bit. And now we have set off on a five-day camping tour. I know leaving my position was the right thing to do, and I feel tremendous relief that I will no longer feel the pressures and responsibilities of that job. I made some good contributions during my time in the position, and now it is time for someone else to take it on. I am still dreaming work dreams every night. But I am also starting to feel more rested. One of these days soon it is going to hit me that I don't have to go to work and my time is my own for these next ten months. I am getting a fresh start on the rest of my life.